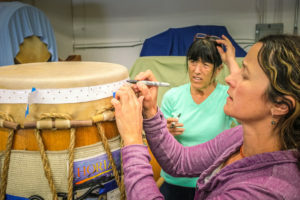 First of all, we want to thank everyone who contributed to our recent crowdsourcing campaign to raise money to reskin several of our drums ahead of the upcoming California Worldfest performance next month. We are busy rehearsing for this event and at the same time we’ve started to reskin several of our drums. We’ve used the funds from the campaign to purchase all of the necessary materials to reskin the drumheads which are in the worst condition. All of the drums in our group are handmade, and many are over 10 years old. Playing on them for over a decade has taken its toll on many of the drumheads, resulting in either damage such as holes in the head, or simply a “dead head” (poor sound quality). We want to go on stage at WorldFest with the biggest “thunder” possible. 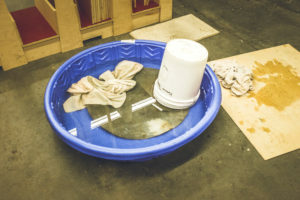 Drum skin soaks in water before start of reskinning process. The reskinning process takes a lot of time and energy over several days to complete for each drum head. This process includes multiple soakings of the raw cowhide which is used for a taiko drum head. Following Mitzi Sensei’s experience and guidance, we employ a combination of traditional Japanese process along with the use of (some) modern tools to complete the process. The use of modern tools helps to accelerate the process and produce a more consistent result. The skinning process takes many hands. 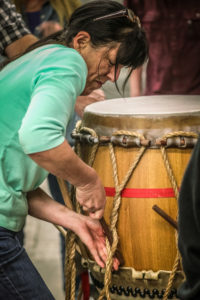 A taiko member tightens ropes during forming process. Holes for the tacks are marked with a template to ensure straight and even alignment. Every member of the group is contributing to the reskinning process and having more hands helps to make the process go faster. 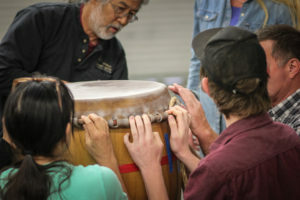 We also believe that everyone involved in the process contributes their spirit to the completed drum. So thank you to everyone who contributed. 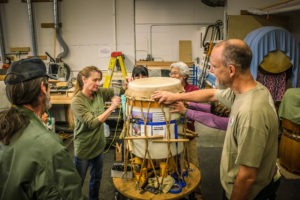 Mitzi Sensei puts the first tack into our first completed drum of 2016! There is still time to help us. If you would like to donate, please use the donate button below to contribute to our drum reskinning project, and we hope to see your smiling face in the audience at WorldFest! Previous Previous post: GVT on Front Page of The Union!